Happy New Year! A new year always has a feeling of hope and anticipation for me. No matter what has come before, or what will actually transpire after, when standing on the cusp of a New Year, anything is possible. Perhaps this sense of exhilaration also comes from a wonderful Christmas season. This Christmas was filled with such a feeling of peaceful contentment that, upon reflection, I realized I had missed for a while now. Aside from some last minute gift and food-prep, there was a distinct absence of the “hustle and bustle”…at least in my own mind. Long weekends were spent lazily wrapping gifts while watching C busy himself around the apartment with a hammer, hanging up our paintings. The time in-between Christmas dinners and get-togethers were filled with long naps and catching up on our reading. And the sense of family seemed stronger for me this year…stronger and more precious. This was something I prepared for a small Christmas lunch in our apartment. Just my mother, my brother, C, and myself. I came across the recipe long ago here, in Keiko’s amazingly beautiful blog Nordljus. The original recipe can be found here. The piece of pork belly I used was smaller than the original 5 kg (we were only four after all), and I didn’t have any fresh thyme (so I used dried), but it turned out delicious nonetheless. I also nixed the sautéed potatoes mentioned in the original recipe; instead we had a green salad. – Preheat the oven to 155C. Lay the pork belly skin-side up on your chopping board and score the skin across its width. – Flip meat over so it is now skin-side down. Sprinkle the salt and coarsely ground black pepper over it, rubbing them well into the meat. Leave to rest for ten minutes so the salt and pepper settle well into the meat. – Sprinkle the herbs, fennel seeds and garlic evenly over it. – Next, tie up the meat. Carefully roll the meat up width-ways and tie it very tightly with string in the middle of the joint. Then tie at either end about 1cm/½ inch from the edge and keep tying along the joint. The filling should be well wrapped, if any excess filling escapes from the sides, push it in. 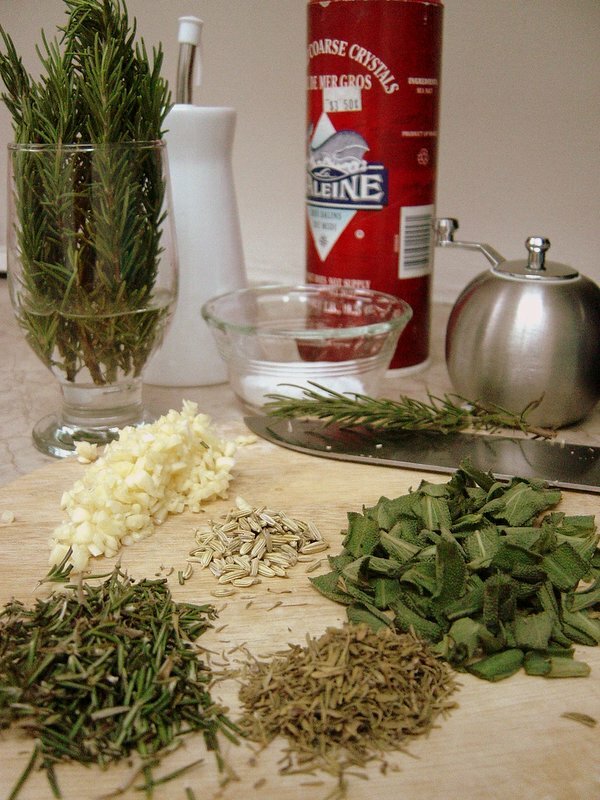 – With your hands, massage one tablespoon of the olive oil all over the joint. Then rub the remaining salt and some more black pepper over it. 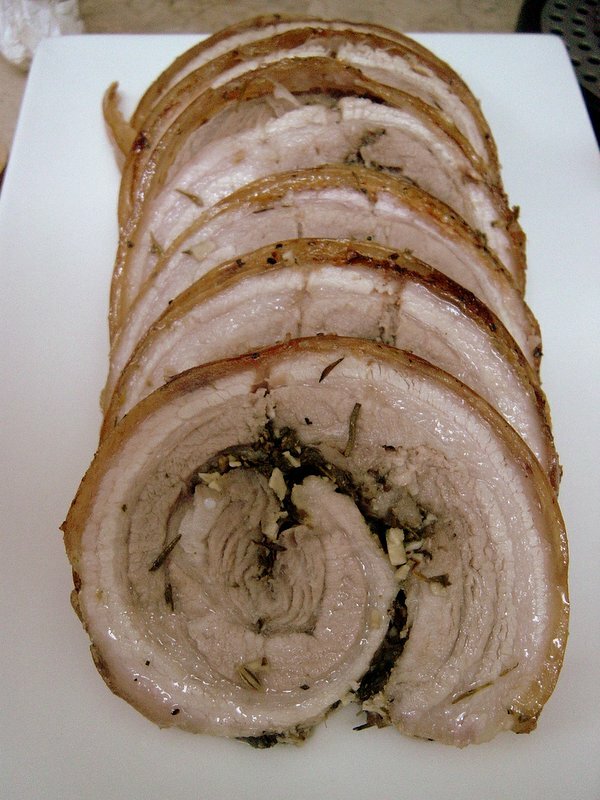 – Grease the rack of a large roasting tin with the remaining olive oil and place the pork on the rack, while pouring some water in the tin itself. Roast for 2.5 – 3 hours. 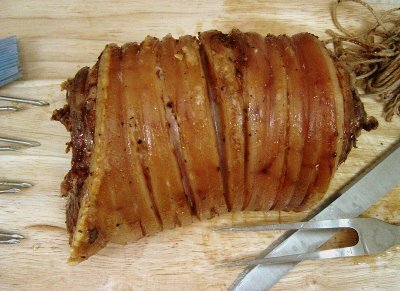 – Increase heat to your oven’s highest setting and roast for 15-30 minutes more to sear skin and (hopefully) produce crackling. – Remove the joint from the oven and coat with honey, drizzling some of the juices from the roasting tin all over it too. Insert a fork in either side of the joint and lift it on to a wooden board. – If you want, you can make some pan gravy. Remove all juices and oil from the roasting tin. Return about 2 tablespoons oil with 2 tablespoons flour into the tin and place on the hob and stir with a wooden spoon until the mixture turns a nutty brown color. Return juices to pan and add some white wine and about a cup of water, scraping the pan to deglaze. Taste and season if needed. – Slice the joint thinly and serve with the sauce. Alternatively, leave the meat to cool and slice when needed. It will keep for up to a week in the fridge. 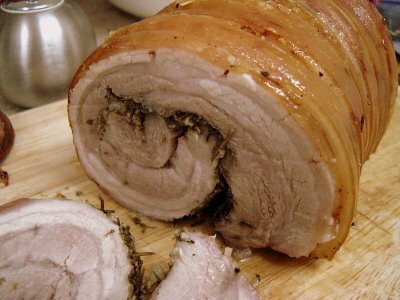 This turned out much better that my first attempt at roast pork…primarily, I suspect, because I would rather be eating a pork belly then a pork loin any day. The stuffing was also incredibly aromatic and produced an amazing flavor…especially the fennel, which I think goes brilliantly with pork. And the honey is just the perfect crown for this dish. Most importantly, to me at least, there seemed to be the beginnings of crackling along the edges. Just a small cluster, fighting to surface, but enough to convince me not to give up hope! I think the emergence of the crackling can be attributed to the change I made in the cooking temperature. A tip I got from Santos. Instead of a high-heat sear in the beginning of the cooking time, I did it at the end. I also put some water at the bottom of the tin, another recommendation from my first attempt. If anyone has more suggestions, please pass them on. 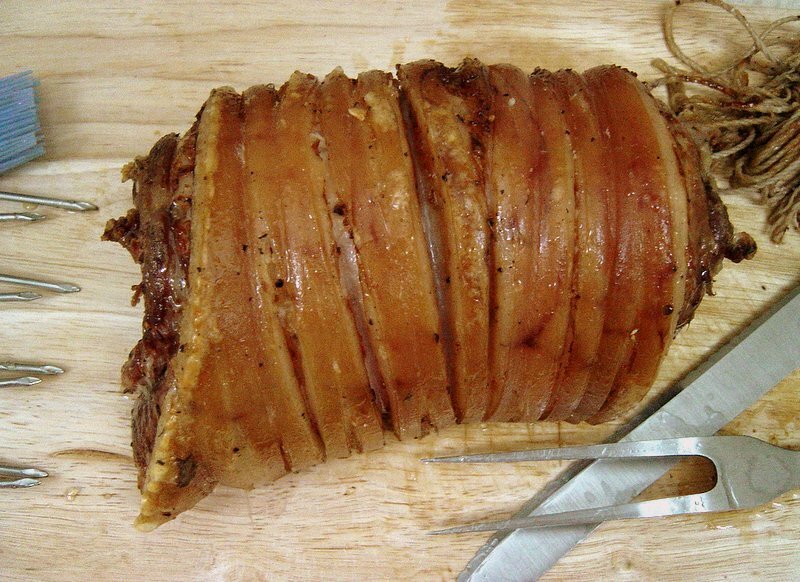 Crackling…you will be mine yet!